Even though it can be hard to make time for breakfast when you’re rushing to school in the morning, there are many benefits of eating a healthy breakfast. Eating breakfast will give you the energy you need to perform your best at school and in sports. When choosing a healthy breakfast, aim to include foods from a variety of food groups. Having a meal with all the types of macronutrients, including carbohydrates, proteins, and fats, will help you to stay full and feel satisfied. Whole grain carbohydrates typically eaten at breakfast include whole grain cereals, oatmeal, and whole grain bread. Foods such as eggs, peanut butter, nuts, and low-fat dairy are all great choices as they have both proteins and healthy fats. What if I don’t have time for breakfast? Many teens think that they don’t have enough time in the morning to make and eat a meal. If you’re running short on time, remember that some breakfast is better than no breakfast at all. Keep breakfast foods on hand that you can eat on the go. 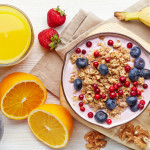 This may include foods such as granola bars, fruit, yogurt or yogurt smoothies, small cartons of low-fat milk or soy milk, small boxes of cereal, or trail mix. Breakfast time is one of the best times to spend together as a family as you can chat and relax before a busy day of work or studying. Below are some breakfast ideas that you can take with you if you don’t have time to eat at home. You can pack nonperishable foods, such as granola bars or cereal, in your bag the night before and just grab anything perishable, such as fresh fruit or yogurt, out of the refrigerator in the morning on your way out the door. Combine all ingredients except nutmeg in blender. Cover and mix on high until smooth. Place butter into medium saucepan over low-heat. When the butter melts, add garlic, parsley & hot pepper flakes (optional). Cook for 2-3 minutes. Add eggs and stir slowly over low heat until the mixture starts to form small curds. Gently fold in tomatoes and add salt and pepper. Lightly toast slices of bread in toaster and arrange egg mixture onto toasted bread. Top with basil leaves and sprinkle with cheese.